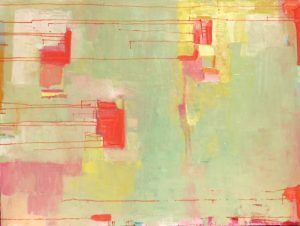 Langford Barksdale opens her show of new abstracts building on her “Color Playground” series of oil paintings, September 1, during the First Friday Gallery Walk from 4-8pm. 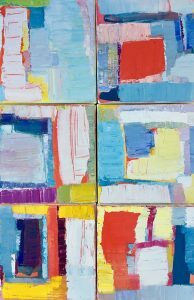 Langford has painted since childhood using creative expression as a means of communication. Raised in the design world, she is the the daughter of one of Nashville’s first interior designers. Her early years were spent surrounded by luxurious fabric designs and wallpaper books. She painted large scale oil canvases in the hallways of her high school utilizing figurative expressive themes as directed by Rosemary Paschall of South Africa, and was encouraged to attend Rhode Island School of Design, where Langford painted large figurative oil paintings for pre-college portfolio preparation. At the University of Georgia she had the opportunity to study under REM’s videographer Jim Herbert and environmental sculptor Mel Chin. During courses abroad in Cortona, she was greatly inspired by the spiritual nature of Italian culture and the imagery painted in the Sistine Chapel and throughout the beautiful architecture in Europe. After receiving her BFA in painting Langford moved to Switzerland to pursue art and theology, traveling extensively and visiting museums from Zurich, to Stockholm, Vienna and Oslo. Two artist residencies in Northern California gave her the momentum and time to focus on creating a series of tapestries that were displayed from the local old growth trees. Her exhibitions continue in a variety of settings from the East to West Coast. Her artwork has become a part of collections across the globe. She has led children’s workshops at Cheekwood Art Center, Aspen Art Museum and served as Children’s Program Director at The Anderson Ranch Art Center. After many years in Aspen, Langford was drawn to the beauty of the Pacific Northwest and now creates abstracts, making paintings inspired by Central Oregon’s landscape. Tumalo Art Co. is an artist-run art gallery in the heart of the Old Mill District in Bend, Oregon. 541-385-9144.